Good Food, Fast Dairy Cookbook on sale now! When you have rushed in from work or have hungry people patrolling the kitchen, thinking of meals let alone cooking them can be difficult. Giving you the inspiration to rustle up tasty meals that everyone will find irresistible, Good Food, Fast is packed with delicious, stress-free recipes that can be whipped up in just 30 minutes or less! With 116 recipes that cleverly use store-cupboard staples as well as combinations of fresh and frozen ingredients, Good Food, Fast ensures you can create something tempting even under pressure. Great if unexpected guests have dropped in or your day has not quite gone to plan. The book is clearly divided into seven handy sections. There is always something to suit the occasion or your store-cupboard and each of the 120 recipes is illustrated with striking photography – so even the most impatient of dinner guests know just what’s in store. The first section covers ‘Speedy Soups’ with recipes such as Tomato Soup with Pesto Cream (see below). Once you have tasted it, you will never reach for a can of Heinz again. The ‘Quick Fixes’ and ‘Everyday Eating’ sections show that even being short of time does mean you have to revert to the same tried and tested meals. With 47 refreshingly different options – you could have something different everyday of week for over a month. Preparing in advance when you have time is always a winner and the ‘Frozen Assets’ section gives plenty of inspiration for pizza bases, sauces, gravy and even cakes and desserts that can be made ahead ready for when you need them. Finish off with something from scrumptious ‘Desserts’ or ‘Take the Biscuit’ – so easy, there is no need to buy in a pudding ever again. 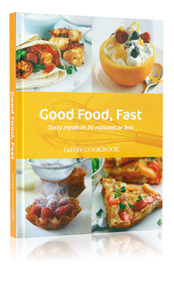 The new Good Food, Fast Dairy Cookbook is priced at £9.99 (plus £2 P&P).